Like many others, prior to the horrific Christchurch Mosques terrorist attack, I had little knowledge of New Zealand Prime Minister Jacinda Ardern. Turns out that ignorance was bliss. Her behaviour since the shocking news broke has grown stranger and stranger. In the aftermath of the killings, she declared that she would never name the alleged shooter, Australian shooter Brenton Tarrant. Why? His name is already in the public domain! It is recognised around the world. He will be named in the impending trial. I can fully understand why she might not want to give him extra publicity. This could be achieved simply by her not using it but to make such a public declaration on it makes the subject suddenly all about HER! To put it bluntly, she is in danger of being seen to be using the massacre to virtue signal. Next up, she went on record saying that there needs to be a global campaign against racism as a response. What has this to do with the actions of a lunatic who expressly said he admired Communist China and claimed Black American Conservative Candace Owens was an inspiration to him? Does she believe Islam is a race? I wonder how she feels about the racist views many Muslims feel towards Jewish people? All sensible people abhor racism but it is hard to see why we need a New Zealand PM to lead this crusade. 24 hours later, there have been more developments. 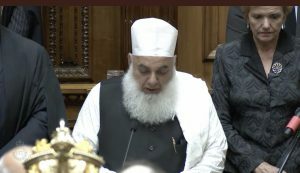 The New Zealand Parliament opens with an Imam reading a Muslim prayer. It has subsequently been announced that New Zealand TV and radio will broadcast the Muslim call to prayer across the Nation on Friday! 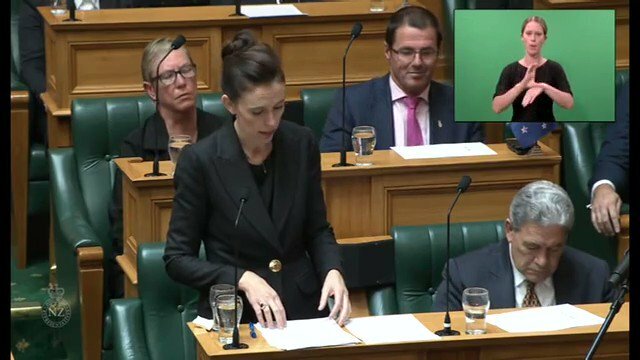 Ardern has also gone out of her way to dress up in Islamic clothing. Why? Responding to a heinous act of terrorism by asserting New Zealand values is entirely appropriate. But why does she think that vacuous virtue signalling and donning the garb of Islam will achieve anything beyond making her look ridiculous. Muslim people should be made to feel welcome and safe but the New Zealand Prime Minister insults many indigenous people of New Zealand by her pantomime theatrics and histrionics. All she needs to do is to stand up and say that New Zealand justice and law will prevail. Yes our government has gone to far. She thinks this is right but it just looks like she trying to hard to please them. It’s dangerous. I feel for the families who lost love ones. One of my workmates lost a family member but why do we have to become Muslim and pray to a god rather than the real God. Jesus king of Kings. Bread of life..
Whilst none of us commenting are New Zealanders, we nevertheless have an objective stance on the situation based on our proximity to the events – however near or far. I do not own a television, so glean news from peripheral sources. However, this is not a matter of how admirable this PM is, but whether her response was a) proportionate and b) appropriate to the alleged events. From my reading of the news, the overwhelming impression was of a government desperate to deprive citizens of firearms, at the exact moment – confronted with the prospect of lone assassins – that every citizen would desire, and potentially should be, armed for their defence. Sound familiar? Marijke, you do not speak for all New Zealanders. Yes, we are all saddened… no, not all New Zealanders think she is an example to world leaders. Censorship, knee jerk reactions, changing the laws without public input, none of these actions are to be admired. We’ve had access to guns for all these years, only 15 gun murders in the last 20 years, that shows we are a nation of responsible gun owners. Now everyone gets punished because of the actions of one person (he was not even a New Zealander!). A good leader thinks carefully about the consequences, then acts, not the other way around. A good leader is not ruled by emotions. Very well put David. I feel exactly as you do but I was (to my shame) worried as to how I could express my feelings in todays repressive society without being cautioned or arrested. I have visited New Zealand many times and toured both South & North islands extensively and whilst I found Kiwis to be tolerant and civil they are also a very nationalistic race. As most new countries are. So for their Prime Minister to be acting in this ridiculous way is, as you say, just virtue signalling and virtue signalling of the worst kind, so much so that it borders on narcissism. David and Phil don’t live in New Zealand and you both have no idea what you are talking about. 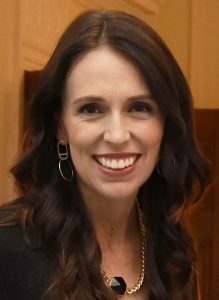 New Zealanders are proud of our Prime Minister and I think she is an example for the world leaders. You don’t know how this attack shocked and saddened the whole country, so please get better informed before writing utter nonsense.